TALLAHASSEE, Fla. – Leonard Hamilton’s day began in an operating room, where he had surgery to remove kidney stones. But by Wednesday night, any lingering pain – and yes, it has been a painful two days for the longtime Florida State men’s basketball coach – was mostly just a memory. Wins over North Carolina have a way of making things better. Braian Angola scored 20 points and C.J. Walker added 18 as the No. 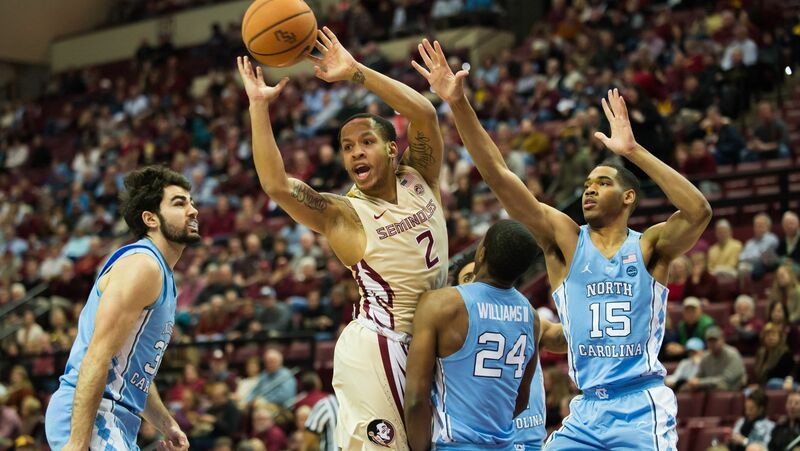 24 Seminoles jumped out to a big lead, then held on late for an 81-80 victory over the 12th-ranked Tar Heels in front of 8,931 fans at the Donald L. Tucker Center. Which isn’t to say that Hamilton wasn’t still holding his breath in the game’s final moments. After UNC’s Joel Berry hit a 3-pointer that cut FSU’s deficit to one with 30 seconds to play, the Seminoles missed four straight free throws that could have effectively sealed their win. Not until the Tar Heels’ desperate, half-court heave fell harmlessly away could Hamilton and the Seminoles finally exhale. But when they did, they were left with several things to feel good about: Their 28th consecutive win at home, their second win over a ranked opponent (FSU won at then-No. 5 Florida in November), their first win against North Carolina in nearly six years and a 1-1 record in ACC play after starting the slate with Duke and UNC. The Seminoles next visit No. 15 Miami on Sunday (6 p.m., ESPNU). But they did, thanks in large part to a torrid shooting effort in the first half, and some serious resolve in the second. With Angola and sophomore CJ Walker leading the way, the Seminoles shot 9-for-20 from 3-point range in the first half and carried a 51-40 lead into the break. Hamilton, however, said he expected the Tar Heels to make a run in the second half, and they proved him right by scoring 16 of the period’s first 23 points to tie the game at 58-58 with 12:59 to play. UNC claimed the lead a few moments later and seemed on the verge of running away with a game that moments earlier might have been a rout in the other direction. That’s when the Seminoles huddled for a timeout that may prove to be one of the pivotal moments of their young season. Walker led the way as the Seminoles and Tar Heels traded baskets down the stretch. First by diving to the floor and tipping a loose ball to Trent Forrest, who threw down a heavy dunk that made it 67-65 and brought the crowd to its feet. And then by scoring seven of FSU’s next 10 points as the Seminoles rebuilt their lead to as much as 76-69. While Hamilton lamented another outing in which the Seminoles were outrebounded – a sore spot in Saturday’s loss at Duke – he also pointed out that FSU got defensive stops and rebounds during crucial moments. Most notably in the final seconds, when Terance Mann gathered a miss from UNC’s Berry that would have put the Tar Heels on top. Or moments earlier, when Mann and Forrest grabbed rebounds that helped keep UNC at arm’s length. That made the Tar Heels’ 41-37 advantage on the glass, as well as their 17 offensive boards, a little easier to swallow. When Tar Heels coach Roy Williams arrived at his press conference, a UNC official told gathered media that Williams was feeling under the weather and asked if his question-and-answer session could be kept short. But Williams, with a bit of a catch in his voice, refused to take the easy way out. Besides, given what his counterpart on the FSU sideline had been through earlier in the day, Williams wasn’t about to ask for any sympathy.